With Sunday morning hockey starting up once again, I was looking forward to my weekly lunches with Milhouse and JuJu afterwards. However, with Vanfoodster's Scavenger Hunt on the sched for the afternoon, it meant I only had minimal time to scarf down some food. My solution? 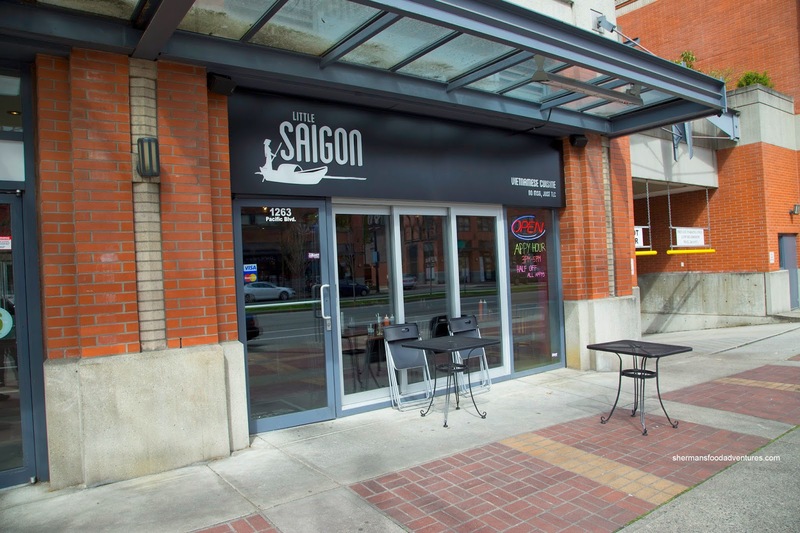 Eat at Little Saigon in Yaletown due to its proximity to the starting point of the scavenger hunt (at Xoxolat). Since Whipping Girl was joining me for the event, she ended up meeting us at the restaurant. 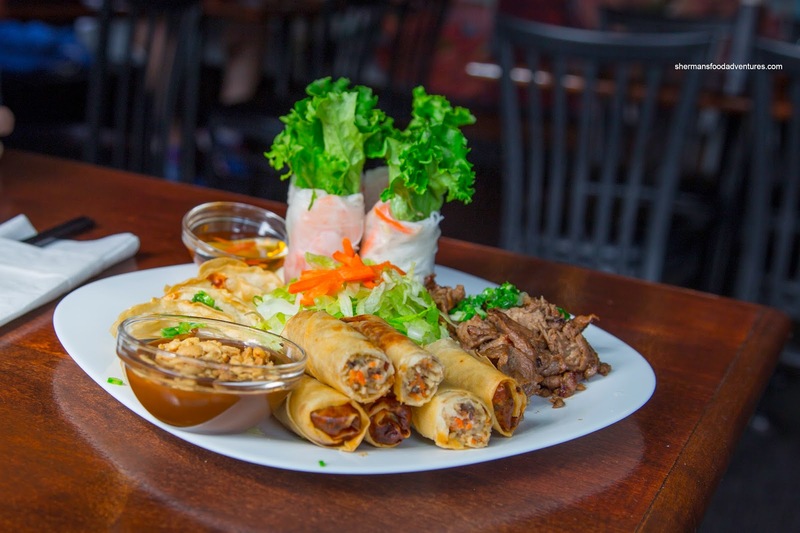 We began with the Saigon Platter consisting of Salad Rolls, Spring Rolls, Dumplings, Grilled Pork and Salad. The salad rolls were a touch loose, but the textures were spot on. Despite the use of wheat wrappers, the spring rolls were crispy while the filling was moist and well-seasoned. I liked crunchy chicken dumplings, but the filling was a bit bland. Although a bit salty, the grilled pork was tender with a good char. For myself, I had to order Tom's Special which was an extra large bowl of pho with meatballs, brisket and rare beef. This was large, but not exceptionally large for the price. I found the broth to be on the lighter side, but pleasant enough. I wouldn't say it had a lot of distinguishing flavours being neither too sweet nor salty. It was fairly clean though and scorching hot (a good thing). I did like the rare beef as it was really tender. As a side note, I asked for no green onions, but with cilantro and as you see in the picture, it was plain. 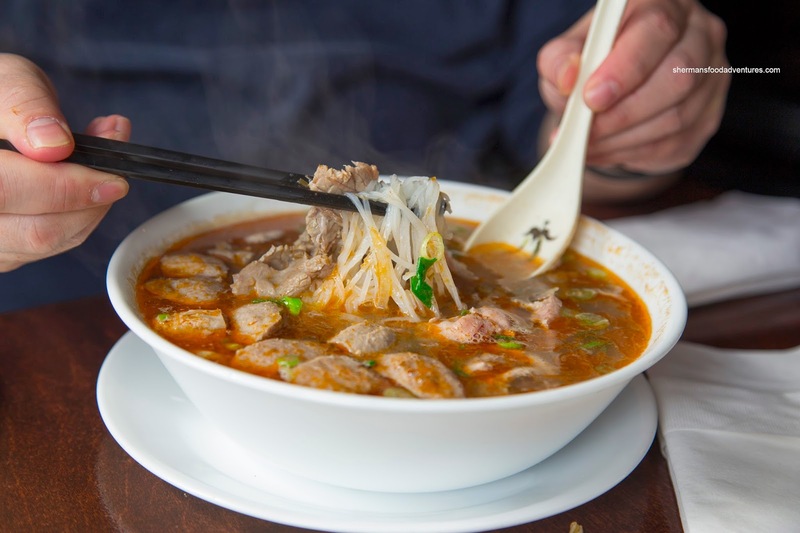 Milhouse had the Saigon Satay with meatballs, brisket and rare beef in a spicy broth. I gave it a try and it wasn't particularly hot (spice-wise), but it was aromatic. 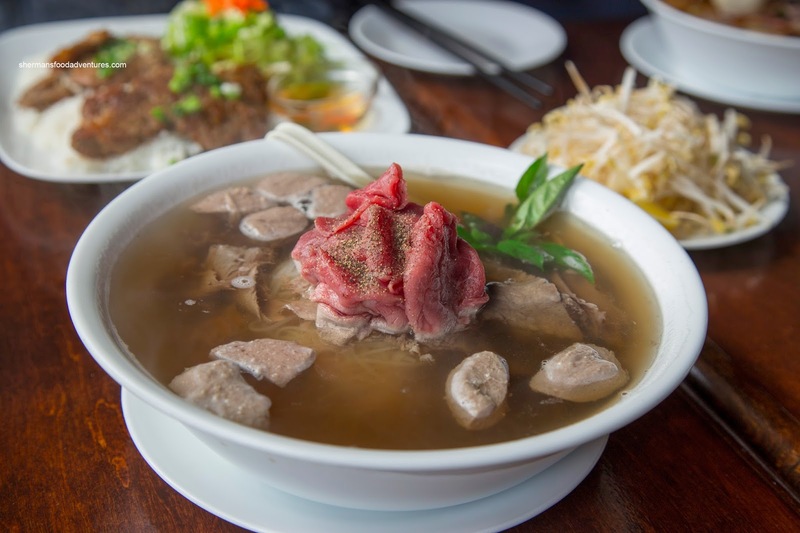 The meats were the same as the regular Pho which was a good thing. Lastly, JuJu had the Lemongrass Chicken on Rice. This was a fairly decent portion on top of a large mound of chewy rice. Although the chicken was tender and sufficiently marinated with enough sugar and lemongrass, it was longing for some char which could've added smokiness and caramelization. 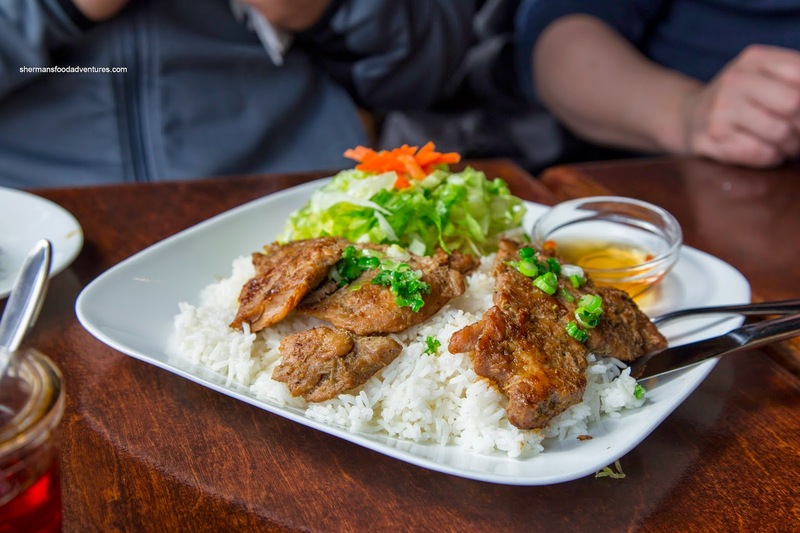 Overall, we didn't mind the food at Little Saigon, especially since there are very few choices for Vietnamese food in Downtown (especially rare in Yaletown). Prices are fairly reasonable given the location and the service we received was courteous.